High-profile sport may not have been at the forefront of George Orwell's mind when he wrote Nineteen Eighty-Four, but there's no doubt that his concept of 'Big Brother' is an aspect of the sports-industrial complex - some may say a positive one. There's no doubt that sport fans like myself are privileged enough to have a keen eye on sporting feats that may not have been viewable in eras past. Indeed, the rise of the internet blogger is probably in part to so many of us having access to more sport than ever before. This was evidenced after the Abu Dhabi Grand Prix last weekend. 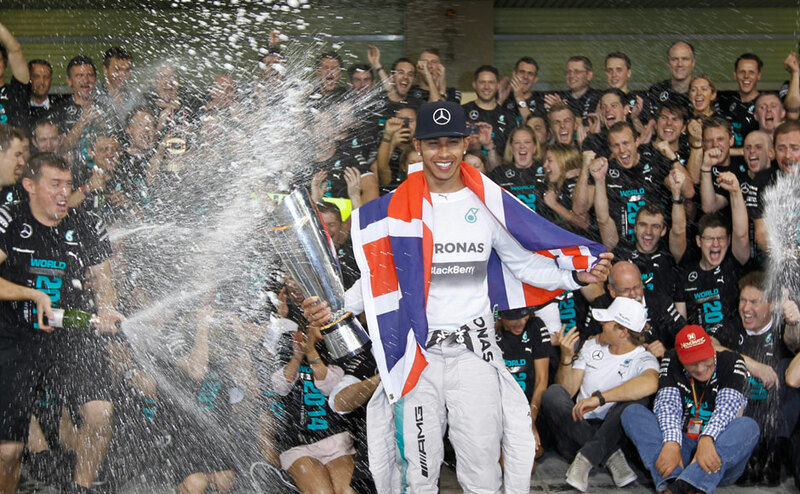 Lewis Hamilton had won the race, and his second World Championship. The Formula 1 season is long and draining, and after securing victory on the final race of the campaign, it was understandable that he wanted a moment to countenance his achievement. But that ever-present camera was there. Big Brother insisted on elbowing their way in on Hamilton's moment, and insisted that we do the same. However, Hamilton deliberately turned his back. Allowing tears of joy and relief to pour forth, this was not a moment to be shared. It was his personal Everest, and he was entitled to allow himself a brief spell of personal reconciliation before rejoining his team and loved ones to celebrate. Hamilton is a figure that often divides opinion, yet we also hear a common complaint that one of the problems with Formula 1 is that there are no exciting personalities anymore. A sport that was once home to figures like James Hunt, Ayrton Senna, and Gilles Villeneuve is now reduced to computer code. A series of numbers on a spreadsheet. With stolid drivers to match. So it's a curiosity that Hamilton hasn't been positioned as the face of Formula 1 for this generation, like Valentino Rossi in Moto GP, or Usain Bolt in sprinting. Putting my personal allegiances aside, what has always made Hamilton such a fascinating sporting presence is the way that he has often eschewed the mask of cliche and nondescript personas of many high-profile athletes. His stunning breakthrough in 2007 led him to clash with both then-teammate, Fernando Alonso, and the team principal of McLaren, Ron Dennis - who had been something of a second father to Hamilton since before his teens. But in qualifying for the Hungarian Grand Prix in 2007 - despite only being a rookie - Hamilton told Dennis to "Go f*cking swivel! ", after being outraged at favourable treatment he felt Alonso was receiving. Hamilton also once petulantly put up telemetry data from former teammate, Jenson Button's qualifying times on his Twitter page. This came after his position at McLaren, a team that helped nurture him from a boy into a man, appeared to be coming to an end. His form took a nosedive after he split with singer, Nicole Scherzinger, and when winning in Hungary in 2013, he dedicated the victory to Scherzinger. Earlier this season, Hamilton was furious when current teammate, Nico Rosberg took questionable means to take pole position at the Monaco Grand Prix - and also led to him winning the race. Hamilton curtly said after that race that he and Rosberg were "not friends", even though they have known each other since they were children. These actions, both good and bad, don't tend to fit in with the way many athletes are PR managed. Smile for the cameras, be polite, entertain the fans, and for the love of god, don't say or do anything controversial. I've always felt that it encourages the public to not view athletes as human. Well, that's not something Hamilton can ever be accused of. He has since got back together with Scherzinger, and I don't think it's much coincidence that his two world titles have come when he has been with her. But it's not the outspoken nature of Hamilton that I think some dislike. After winning the 2013 NBA Championship with the Miami Heat, LeBron James memorably observed that he wasn't "even supposed to be here." For James, read Hamilton. You don't see many people who grew up on council housing in Formula 1. Don't see much in the way of black people, either. Through a mixture of preternatural talent, incredible diligence from his father, Anthony, and the requisite sprinkling of good fortune that every successful person needs, Hamilton has entered a space where black people are conspicuous by their absence. Hamilton appears to be more of a Tiger Woods, than a Jackie Robinson. His arrival in Formula 1 is yet to lead to an increase of racial diversity in the paddock, Which isn't surprising when you look at the vast fortunes required to compete. And while he hasn't been overtly political - at least not publicly - his sheer presence is a cultural touchstone. And he carries many accouterments that are associated - often negatively - with his race; From jewelry, to clothing, to his taste in music, right down to his R'n'B singer spouse. It should go without saying that these are things that shouldn't matter. But it doesn't go without saying. Apparently, these are all things that in aggregate, combine to make Hamilton seem arrogant, spoiled, and easy to dislike. If you want to be a black sporting superstar, don't be too "black", At least not any more. It would take a leap of pure delusion to think that Muhammad Ali would be lauded if he came onto the sporting scene now. Michael Jordan, however? Mr "Republicans buy sneakers too"? The apolitical corporatisation of Tiger Woods is another example, until fulfilling the stereotype of the hypersexual black man ensured he was no longer "role model" material. While it's easy to find people who champion diversity, it's often done without having to back up those words with deeds. Whether it's the lack of coaches of colour in English football, or the unequal coverage of England's women rugby union team - who, lest we forget, are World Champions - many prefer the idea of diversity, rather than actually doing anything about it. But why I'm especially pleased to see Hamilton reach the peak of his sport isn't just the fact that he proves the lie to the accepted consensus that Formula 1 is solely a playground for the rich, white male, but also that he belies the theory that sporting success can only be attained through a robotic, pre-programmed approach. In sport, it's become received wisdom - possibly propelled by neoliberalism - that emotions at the top level cloud one's judgement. But for Hamilton, his emotions are his judgement. Without them, he may not have been able to produce the scintillating move from the start line last Sunday which secured the world title. I hope one day Formula 1 learns to appreciate Hamilton. Britain, too. Both don't know how lucky they are to have him. - With Chelsea's formidable start to the Premier League already making them champions-elect with over two-thirds of the season remaining, one of the big stories of the league's narrative has been the pleasantly surprising performances from Southampton. After losing their manager, and a clutch of their best players this summer, they were tipped by many to struggle this campaign, including being among some pundits tips to be relegated. At the time of writing, they lie second in the table. But before we start dishing out the humble pie, Southampton's better displays have come against mid to low-ranking Premier League sides. Their two defeats this season have come against Tottenham and Liverpool, two teams who will expect to finish above the Saints come May. Southampton's next three fixtures: Manchester City, Arsenal, and Manchester United. A trip to Burnley is then followed up by the visit of Everton. If they come out of those five games with daylight still between them and the chasing pack, then they have a fighting chance of making the top four. Until then, I'm not proclaiming them as the story of the Premier League just yet. - There's a lot been written about this topic, but I feel the only correct thing for me to say is that my thoughts are with Phillip Hughes's loved ones, Sean Abbott, and all of Australian Cricket. R.I.P, Mr Hughes. - Although one could contest that Marc Marquez has that crown now. - Look at the picture I used at the top of this post. Now find me another black face besides Hamilton. Take your time. I'll wait. - Yet the myth of black men being inherently bad fathers continues apace.